IT ALL BEGAN FOR MARCOS IN NEW DELHI INDIA WHEN THE MOVIE GANDHI PREMIERED IN 1982 . IT WAS AN AWAKENING TO SEE TRUTH AND NON-VIOLENCE PUT INTO ACTION. THE MAHATMA WAS SHOWING US AN ANCIENT WAY TO LIVE AND WORK FOR A MORE PEACEFUL WORLD THROUGH VILLAGE LIFE. THROUGH THE MEDIUM OF SPINNING AND WEAVING WE CAN CONNECT WITH THE SPIRIT OF INDEPENDENCE. IT IS A NOBLE WAY FOR A GREATER DISTRIBUTION OF RESOURCES. In 1974, a 14 year old named Marcos (Mark Brown) arrived in San Sebastian looking for magic. The great-grandfather of Eliseo Ramírez (one of the people currently in charge of Khadi Oaxaca), Donaciano López, brought him into the village. Throughout his young adult life, Marcos stayed there learning and living for several years before deciding to travel to India. In India he spent many years and learned about khadi, the movement started by Mahatma Gandhi. He lived in Gandhi's ashram for two years (1986-88). In 2010, Marcos and his wife, Kalindi, began working with Khadi, through a coyuchi cotton thread workshop with more than 30 women from the village. 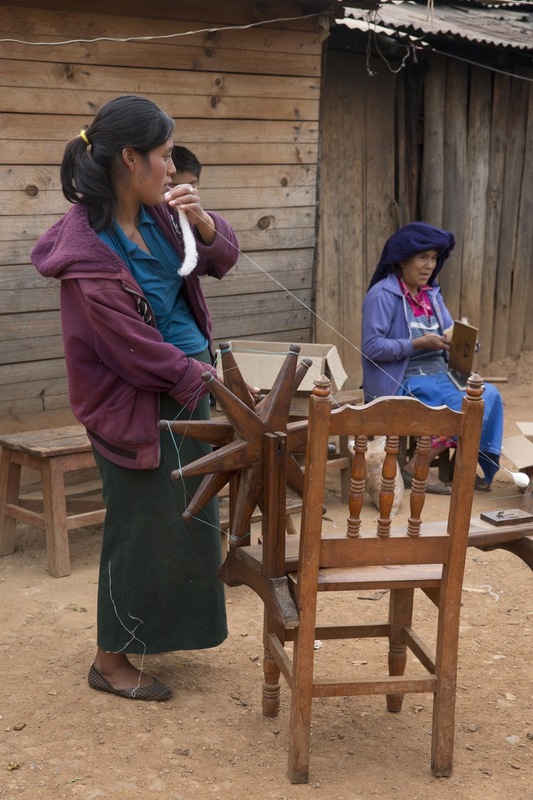 Once there was enough thread, their good friend, Remigo Mestas, began turning it into exquisite traditional huipiles. Remigio's beautiful work inspired them to continue on. Foster supportive relationships within families, within the and with the earth.